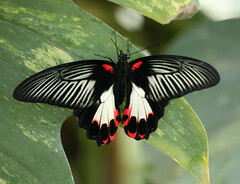 The Royal Horticultural Society Gardens at Wisley have again this year got their Butterflies in the Glasshouse exhibit on. A couple of people I know went last year and took some great photographs so I was pleased to see it on again this year so that I could visit. So last week I managed to book a day off work and head up there with mum. It turned out to be a beautiful sunny day, so it was a pleasure to walk around the gardens as well as visit the glasshouse. It was surprisingly busy for a week day in February, but not so much so that you couldn’t get some nice photographs. In fact, in places the grassed areas were roped up while they were helping the grass to grow back and as a result it was possible to get some nice shots across the ponds without lots of people in the picture. I was particularly pleased with this shot I took. There was some beautiful colour in the plants and the water, and because it was Winter the sun was lower making for a better light for the photograph. After a lunch we headed down through the rock garden area and through one of the smaller glass houses which has some lovely flowers. We also met up with Sunny who is the cat who lives there – he had found himself a nice sunny spot on the rocks outside. Inside the glasshouses there is an outer and an inner area – the outer area was magnificent with some absolutely stunning orchids and cactus. And then the inner area contain more tropical plants and of course the butterflies we had come to see. It took quite a while for the camera to aclimatise enough to stop fogging up. The area inside was also quite busy, and there was a school party wandering through, which made it really hard to get any decent shots of the butterflies as they didn’t settle for long. Overall I thought Wisley was a nice place to visit, and if you can go with a friend who is a WHS member you can get in for free! So I’d like to visit again at a different time of year. 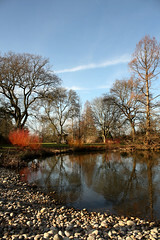 More photographs on my Wisley set on Flickr. I was just beginning to think I wasn’t going to take any photos this month – the weather hasn’t been good and I haven’t felt very inspired. I’ve also only just finished processing some shots from last month. Anyway, I’ve just finished reading and completing the first module of an editing course in the Practical Photography magazine and was thinking that I really needed to make some effort so I just happened to stick my head outside my front door to see if it was still raining as there are some large mushrooms that have grown in my front garden. 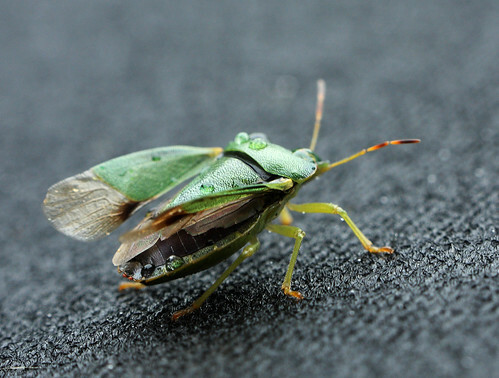 It was still raining and I didn’t feel like crawling around on a wet garden, however just as I was heading back inside I spotted a Green Shield Bug having a rest on the roof of my car! 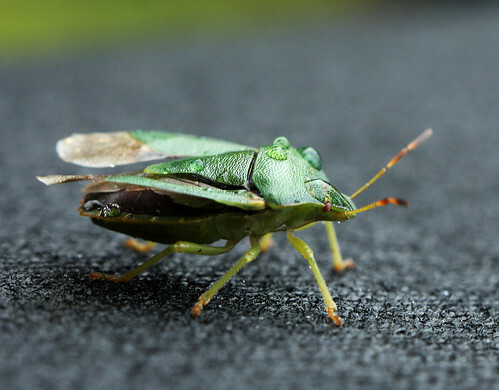 I was bought a new Raynox Macro lens for my birthday last month and I haven’t used it yet so I quickly whipped it on and ventured back outside to take a few pics of the bug. It also gave me a chance to have a practice at playing with Levels and Curves on Photoshop ready for the next modules on the course. So anyway, here are my first few attempts. 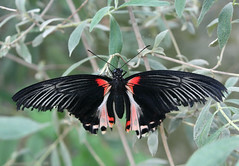 Yesterday we decided to visit Earnley Butterflies and Gardens near Chichester. I see the brown tourist sign every time I head along the A27 and thought it would be a good opportunity to get some nice butterfly shots. Alot is under cover too so thought it would be good in case the weather didn’t hold out. On arrival in the carpark we had a feeling it didn’t look promising inside as the outside isn’t that well presented. As we entered it got worse! The reception area and shop looked a bit like an old charity shop. The butterfly room was pretty tiny and there wasn’t very many butterflies at all. It was rather sad, as the room they had at Epcot wasn’t much bigger but had been presented so much nicer. I don’t think it would take too much work to make it nicer, but it just felt neglected. I did manage to capture a few nice butterfly shots but overall I was really disappointed – as after all it was supposed to be a butterfly place! After the butterfly room we went into a bird room. This felt slightly better – it looked a little better kept. 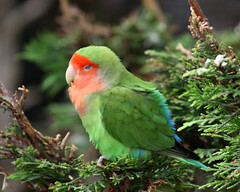 Many of the birds are rescue birds so it was nice to see they were taking care of them in their new home. After the bird room we wandered into the gardens, and wished we hadn’t bothered! Maybe at a different time of year it may look pretty if there are flowers out, but at the moment it was a very sad excuse for lots of interlocking areas with hedges and not much else. The Japanese garden only differed from every other part by the fact someone had stuck a Japanese style ornament in one corner! Finally we wandered into the Noah’s Ark Animal and Reptile rescue. This seemed much better kept. The animals all seemed happy and well looked after and there was plenty to see. 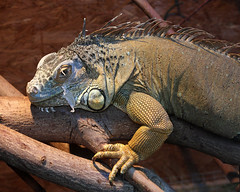 There was a variety of animals from farmyard – goats, chickens, rabbits – to reptiles such as snakes, lizards and tortoise. There is also a nostalgia centre there but it looked like a dark, dingy and run down museum so we didn’t waste any time going in there. Overall I am happy to have spent the £6 entry fee (normally £7 but they have a voucher on their website for £1 off) as I think the money will go towards a good cause of caring for the animals. I was very disappointed with the butterfly enclosure – which is after all the reason I went in the first place. The whole place is in need of some care and attention and I wouldn’t go again or recommend it unless you were going for the Noah’s Ark rescue centre which is nice enough.